In their first significant statement since last Friday’s re-election of President Hassan Rouhani, Iran’s Revolutionary Guards have proclaimed the construction of a third underground facility for production of ballistic missiles. 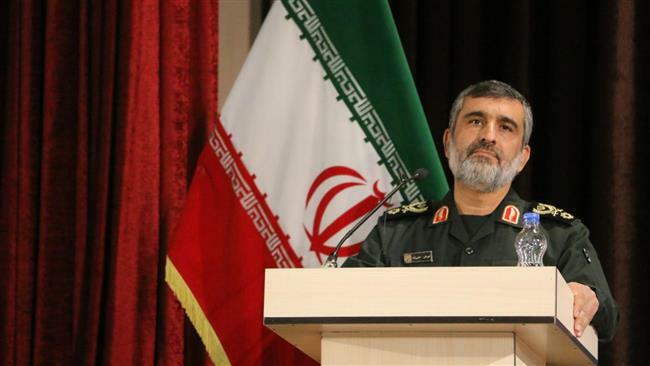 The commander of the Guards’ Aerospace Division, Brigadier General Amir Ali Hajizadeh, declared on Thursday that the Islamic Republic will continue to strengthen its “defensive missile might in the face of security threats facing the nation”. It is natural for the US and Israel to be concerned and nervous over our missile production, missile tests and the display of our missile cities as they always want the Iranian nation to be in the position of weakness. I hereby announce that in recent years the third underground missile production factory has been inaugurated. Hajizadeh’s statement appeared to be not only a message but also to Rouhani, whose return to office was opposed by the Guards as their outlets promoted hardline cleric Ebrahim Raisi. During the campaign, the President criticized the Guards’ approach to ballistic missile testing, saying that it was jeopardizing implementation of the 2015 nuclear deal with the 5+1 Powers and thus hindering Iranian economy recovery. Rouhani said that provocative slogans on the missiles further risked alienation of international goodwill towards the Islamic Republic. In his victory speech, Rouhani was more conciliatory, praising the Guards for their contribution to the security of Iran and saying that the missile tests were defensive and should continue. The Tehran Friday Prayer Leader, Ayatollah Movahedi Kermani, has tried to play down the significance of President Hassan Rouhani’s re-election, declaring that elections violations may have inflated his victory by “several million votes”. The cleric said, “It is possible that after monitoring and reviewing reports and voting violations, it will be determined” that hardline candidate Ebrahim Raisi received a total of 16 to 19 million votes, with Rouhani obtaining 21 to 23 million votes. Rouhani officially won the election with 23.5 million votes (57%) versus Raisi’s 15.8 million (38.5%). Movahedi Kermani’s violation was not to change the outcome, as he acknowledged in his sermon, but to restrict the legitimacy of a Rouhani victory which was far larger than expected going into Election Day, given the hardliner-conservative unity around Raisi, a concerted campaign — supported by the Supreme Leader — against the President and his Government, and concern over Iran’s economic situation. The Friday Prayer leader said that he is waiting for the Guardian Council to “judge correctly” the election in light of the supposed violations. The Rouhani camp has countered that the President’s win would have been even bigger had the Guardian Council not block efforts to extend voting hours for the large turnout. The President said four million people were unable to cast ballots, but Guardian Council spokesman Abbas Ali Kadkhodaei said Rouhani was given “false” reports.